Chickadees, wrens and tree swallows like swinging birdhouses. 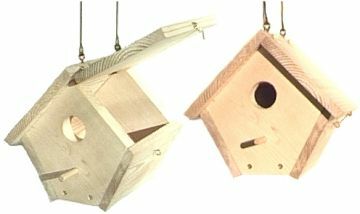 The swinging wren chickadee house has two brass screw eyes in the roof peak for suspending from a tree limb or post with wire, chain or rope. Another version has a keyhole in the back panel for mounting on a tree, post or wall with a screw fit through a keyhole in the rear panel and the roof is cut flush with the back panel. Both versions have one hinged roof panel, which is secured in closed position with a shutter hook. Ventilation holes are drilled in the floor and a perch is inserted in the front panel under the entrance opening. Pilot holes in primary work pieces can be slightly larger diameter than pilot holes in secondary work pieces. This allows for easier screw-insertion into primary work pieces and alignment with secondary work pieces where screw threads must fasten more snugly. Mount on or suspend from a tree, post, fence or wall between four and twelve feet high with partial sun and shade. See each particular bird species page for specific habitat and mounting instructions. Remove the nest in late summer or fall after the brood rearing seasons are over. Assemble woodworking projects in a safe area. Wear eye protection. Eye injuries are the most common serious injury. Keep hardware and tools away from children and infants; store away when not in use. 1. Attach back and front to floor with screws using phillips screw driver. 2. Attach right and left sides to front and back. 3. Attach stationary roof panel so that hinge pilot holes are at the peak. 4. 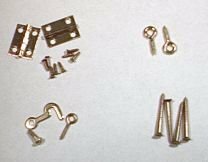 Attach hinges to roof panel with small screws and small phillips screw driver. 7. Attach hinged roof panel to stationary roof panel using small screws and small phillips screw driver. 8. Snug fit perch into front panel. Glue if necessary. 9. Turn large screw eyes into pilot holes in stationary roof peak of hanging version. 10. Suspend hanging version with 4 – 6 inches of wire, rope, or small chain from a tree limb or eave. 11. Wall mounted model: Turn large screw into wall, fence, or tree. Leave 7/8″ between wall and screw head. Fit key hole slot over screw in wall. 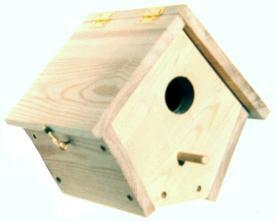 The classic swinging wren chickadee house can also be fixed in place. Chickadees, wrens and tree swallows like swinging birdhouses. The swinging version model has two brass screw eyes in the roof peak for suspending from a tree limb or post with wire, chain or rope. Both versions have one hinged roof panel, which is secured in closed position with a shutter hook. Ventilation holes are drilled in the floor and a perch is inserted in the front panel under the entrance opening. More bird species than are listed above (based on the box volume and hole diameter, 1 1/4″) will nest in this box.